We’ve already favourably reviewed the Corsair Vengeance M90 gaming mouse, and now it’s time to try out its younger sibling, the M60. Apart from sharing a name with one of gaming’s most treasured light machine guns, what does the M60 offer? Well, it’s aimed at a much different audience: FPS gamers. With few additional buttons and a dedicated ‘sniper mode’, the M60 offers a much lighter experience that should definitely please its target market. How does it live up to expectations? Read on to find out. 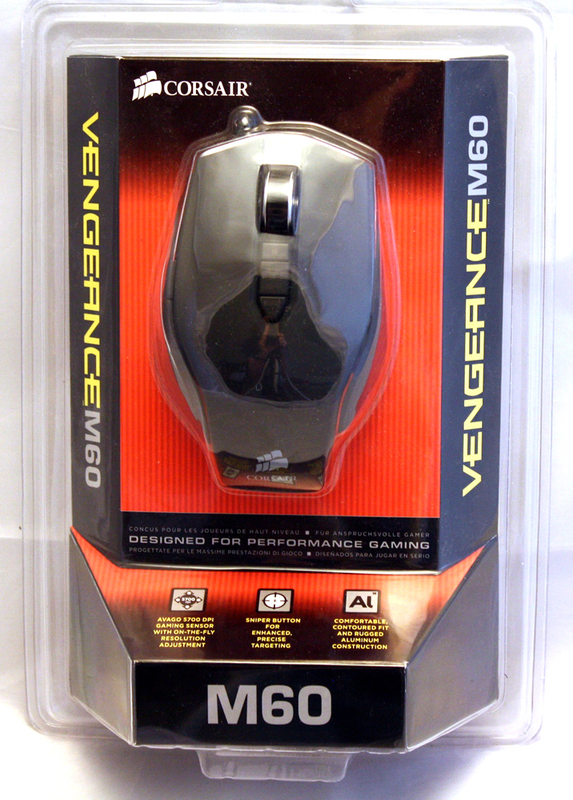 The packaging of the M60 is quite similar to the M90 but in a red color scheme instead of a blue one. It’s a standard shrink-wrapped plastic job, but thankfully includes a cut-out panel in the back which lets you remove the mouse without shredding your hands. 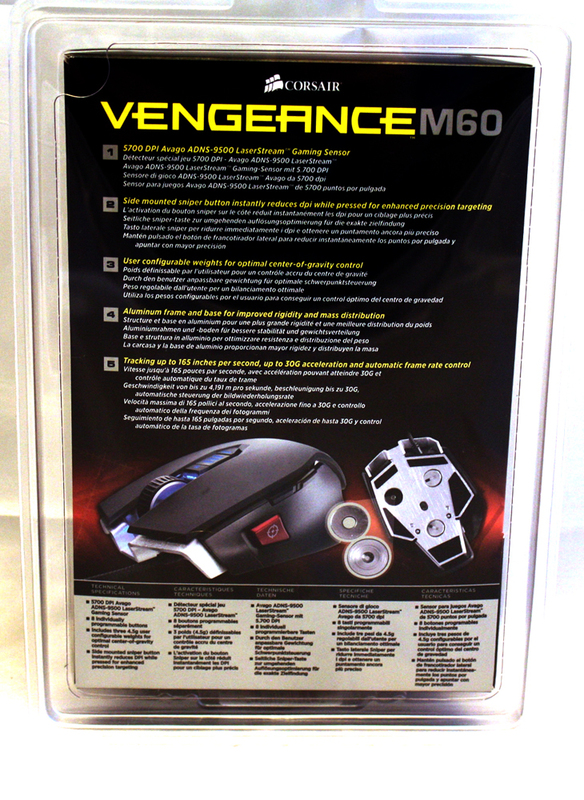 On the front of the box, you’re given a first look at the mouse itself, along with a list of features. The back of the box is similarly pedestrian, offering features in several languages as you’d expect. It’s a tastefully done package that should attract the eye with its red colour, but isn’t quite up to the par with the full boxes used by other companies (although it is a lot more space efficient). Let’s continue on to the mouse itself. 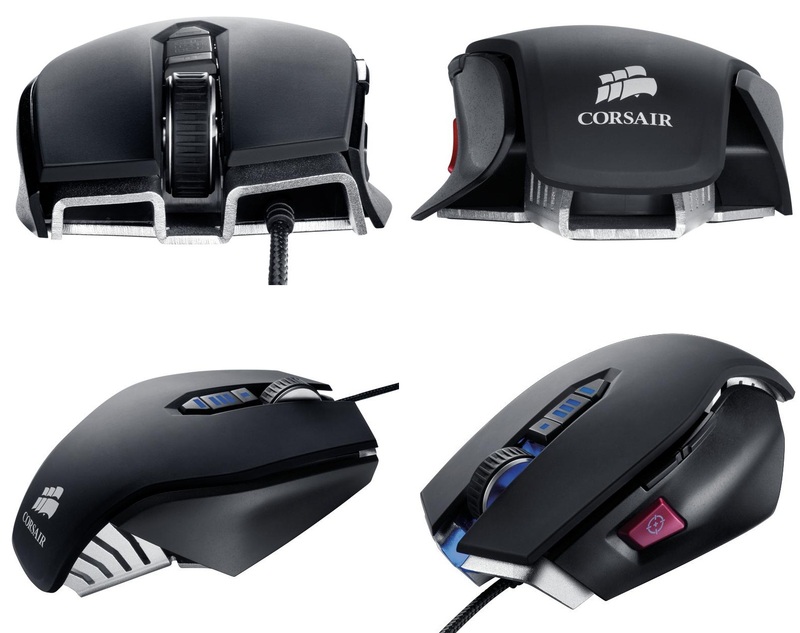 Overall, the mouse is awesome. I love how it feels. The form fits nicely into the hand and my hands are somewhat large. For my first gaming mouse, it is a winner.